The Smooth Fitness 5.65 folding treadmill offers a number of features which make it an excellent choice if you’re looking for an affordably priced yet full featured treadmill. One of its most intriguing features is the SmoothDrop folding frame. 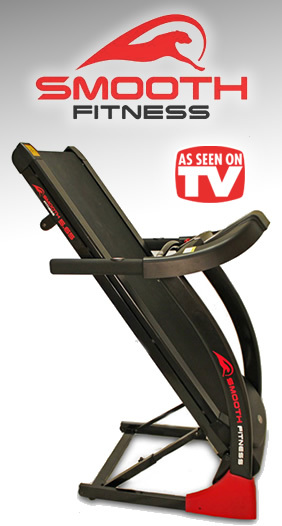 Ordinary folding treadmills can sometimes be cumbersome to fold up but the SmoothDrop system uses gas shocks to handle the “heavy lifting” so to speak. Another innovative feature of the 5.65 treadmill is the heart rate control. What this does is monitor your heart rate and dynamically adjust the treadmill settings while you’re working out. This provides a tailor-made workout which means you burn more off more unwanted fat faster. SmoothDrop folding frame incorporates gas shocks which make folding the 5.65 treadmill for storage a breeze. It’s so easy even a child can do it! Spacious 20″ x 55″ treadmill surface makes the 5.65 treadmill perfect for runners of all sizes. Convenient LED display keeps you fully informed with time, distance, calories burned, heart rate, speed and incline. Speed range of 0.6 to 10 MPH. 15 incline levels ensure a powerful workout for everyone. Commercial-grade SmoothDrive 2.75 HP treadmill motor designed to provide long life and totally silent operation. 14 workout programs designed to keep you challenged, maximize your workout, and ensure consistent progress. Convenient built-in shelf for books, magazines or media devices. The 5.65’s Im-Pression shock absorbing cushioning technology makes running easy on your joints by providing a soft landing for your front foot while simultaneously providing firm push-off for your rear foot. This produces a more comfortable, low impact workout which means that you can run longer and burn more calories. Adjusting the controls is a breeze due to Smooth Fitness’ QuickChange technology. You can easily adjust the speed and incline with the controls which are conveniently located on the handrails. All in all the Smooth 5.65 treadmill is an advanced fitness solution that offers impressive functionality at a price that’s not too hard on the wallet.